Snail mail still relevant. Sample whisky drams by mail. Yes, you can. When it comes to whisky, there are some great ones out there that are simply too expensive or too rare to consider buying a full bottle. Some of these whiskys are so hard to find that you have to travel to some of the world’s great whisky bars just to get a sample of them. 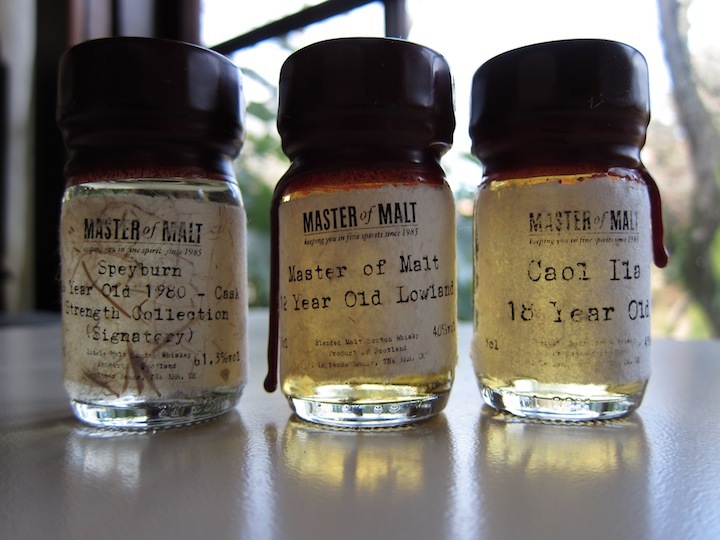 Masters of Malt, an online whisky store out of the UK, has an innovative program which enables you to get a dram of some of these rare, expensive and special whiskys, shipped directly to your doorstep. Encased in small wax-sealed bottles, these Drinks By The Dram represent an amazing opportunity to experience some of the finest whiskeys in the world. Samples range in price from about $4 all the way up to over $120 (for the Glenfarclas 1952 Family Cask) for 30ml of whisky. The selection is pretty strong, with over 250 different whiskys to chose from. For our three drams of whisky, we picked a Caol Ila 18 Year, Master of Malt 12 Year Old Lowland and Speyburn 26 Year Old 1980 Cask Strength Signatory Collection.These three selections gave us a cross section of three very different kinds of whisky and ones we wanted to try but never had the opportunity.